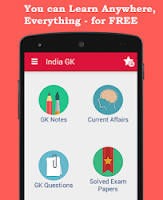 Current Affairs MCQs of 16 July 2015: Current Affairs Daily Multiple Choice Questions (MCQs) for India GK, World GK and current affairs with Collection of daily objective type Question by www.Indiagk.net based on General Knowledge (GK) and General Science (GS) Questions for UPSC, State PSC, SSC, Police exam, Railway exam, SBI, Bank PO, IBPC, SSC, LDC, UDC, Army, Airforce, Navy, Coast Guard, Bank Clerk, TET and all entrance examination with current affairs News, Multiple Choice Questions (MCQs) available on Website www.IndiaGK.net and Android Apps with daily updates:. Social activist Anna Hazare announced to go on indefinite hunger strike from October 02 over ? Bangladesh Beat which country in ODI series after india in July 2015 ? PM approves MoU between India and -------- in the field of Civil Aviation on 16th July 2015 ? Central Institute of Post Harvest Engineering and Technology (CIPHET-ICAR), becomes 30th Designated Testing Center is situated at ? Government on 16th July cleared Rs 7,558 crore 6-laning of NH NE-II to help growing traffic of ..... ?